How shaky were the riders being held at the start? Many UK riders watching the opening team time trial will know what the sensation of being held at the start of a TT is like. The old ‘left a bit, right a bit, bit more, not that much….’ seems to happen every time no matter how experienced the holder. The riders on the start ramp of the team time trial looked more worried about falling over than the upcoming effort judging by the way they were fidgeting on the start ramp to stay straight while being held. Each rider was held by a lady in typical local attire who appeared to be more worried about their appearance than the stability of the rider they were balancing. Towards the end of the first road stage it was great to see the distinctive jersey of British road race champion Peter Kennaugh (Team Sky) on the front driving the race. 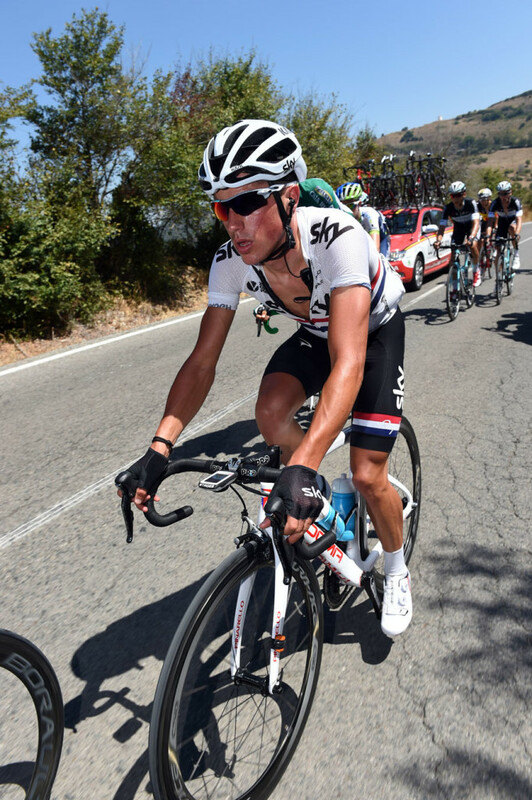 He was on or very near the front from 12km out to just over 2km keeping team leader Chris Froome out of trouble. With job done he wisely moved over and let the sprinters’ teams take over duties to try and set their riders up for the stage win. We also like the fact he wears black shorts with the white jersey! Of all the places to start a stage an aircraft carrier is pretty unique. We’ve had plenty of structures built over water and riders using flash boats to get to stage starts but never from a boat that we can remember. Stage 3 started on board the deck of the Spanish Navy’s Don Juan Carlos I aircraft-carrier which gave riders a chance to mooch around at the start for photographers in many different settings. 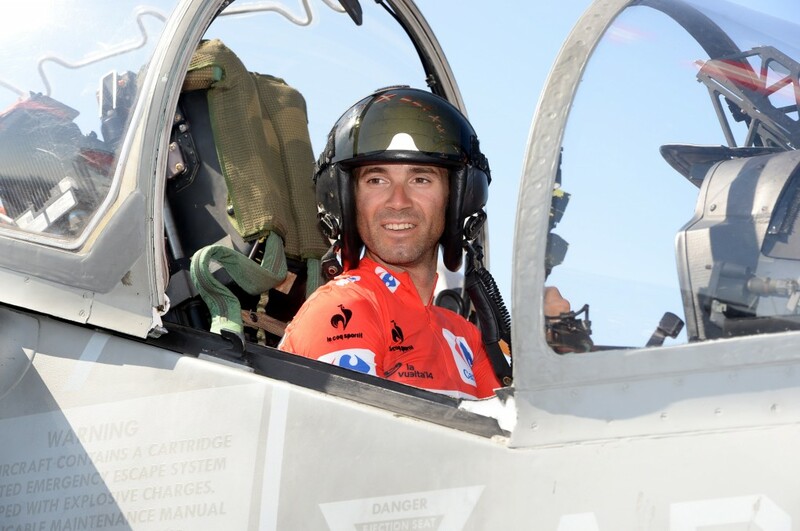 GC leader Alejandro Valverde (Movistar) went Top Gun and got into a fighter jet while Alberto Contador (Tinkoff-Saxo) donned a captain’s hat for the snappers. Some riders thought this a distraction and joined the peloton when it rolled of the ramp of the ship and got barraged by hacks in the process. 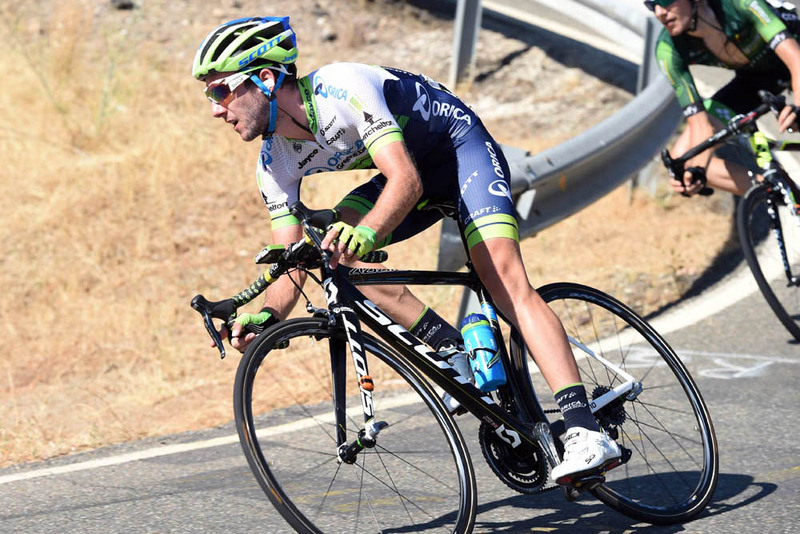 When it was announced that young Brit Adam Yates (Orica-GreenEdge ) was riding the Vuelta we knew he wasn’t going to just ride around to get experience in his first Grand Tour. 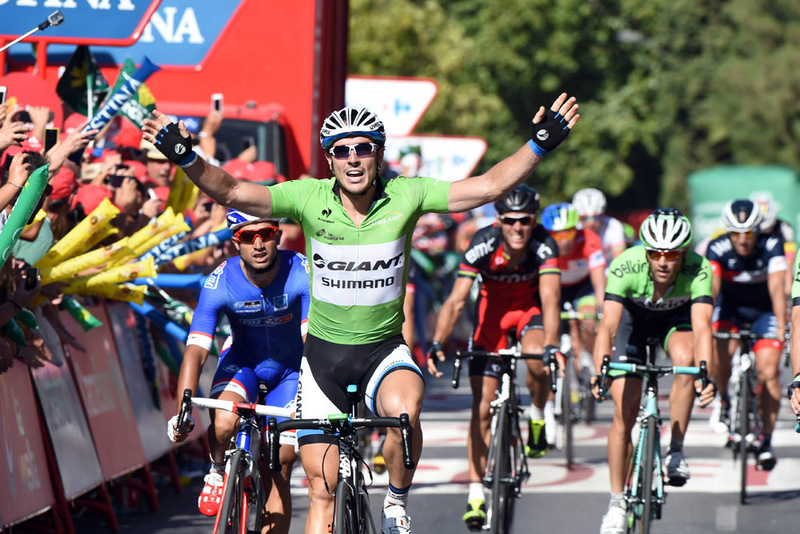 He’s had an incredible debut season in the pro ranks winning the Tour of Turkey and several placings in high profile events. Today he got in a break of four which although was doomed from the start, he was marshalling for current race leader Michael Matthews and the bunch were never going to allow Valverde to sneak away, it was great to see him get stuck in and show he is here to ride. We can’t wait to see how he goes when given a free reign in the hilly stages. Looking at the riders at the end of the stage it was easy to see John Degenkolb (Giant-Shimano) was a clear winner while Nacer Bouhanni (FDJ.fr) just behind was waving his fist. Bouhani thought he was pushed over by Degenkolb but looking at the finish again it was a fairly straight sprint straight. He was lucky to stay upright as there was no room to pass on the inside and he nearly clipped the feet of the barrier just before the line. Also getting battered by countless number of inflatable freebies didn’t help as the spectators were hanging well over the barriers no doubt limiting his passage or at least his view.